When Walther introduced the CCP pistol in 2014, it became a very popular seller thanks to it’s recoil reduction system and ergonomic grip. It ended up being quite popular with the CCW crowd and even won the coveted Golden Bullseye Award from Shooting Illustrated. However, one major complaint with the CCP that has been mentioned time and time again is the fact that it required a tool for disassembly and cleaning. (1) Tool-less take-down and disassembly – Although on the surface this sounds like a minor upgrade but it’s really a pretty significant upgrade because the CCP uses a fixed barrel. (2) A red visual cocked indicator that is hard to miss as it’s located right at the rear of the slide. Aside from those two major upgrades, the CCP M2 also includes all the same great features found on the original Walther CCP. Although the suggested MSRP starts at $469, the expected street price is in the $390 to $410 range. #1 – I have the original Walther CCP and love it but want to upgrade to the new CCP M2 version. Will the new CCP M2 version fit in the holster made for my original CCP, or do I have to go buy a new holster for the new CCP M2? Good question, and the answer is yes, the new CCP M2 will fit in a holster made for the original Walther CCP as well. The “first generation” Walther CCP and the new Walther CCP M2 have the exact same dimensions so both versions will fit into a holster made for the Walther CCP. 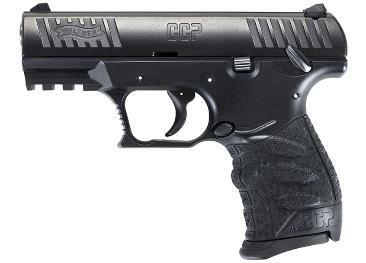 #2 – I’m thinking about purchasing the new Walther CCP M2 and getting a Crimson Trace CMR-206 laser. My concern is finding a holster to fit that set-up. Do you have a holster that might work? We can certainly help. Any holster listed below is available in a version to fit the Walther CCP M2 with a Crimson Trace CMR-206. #3 – Will you be offering any magazine carriers to fit the new Walther CCP M2? We do offer magazine carriers to fit the Walther CCP M2, and those can be seen here: Magazine Carriers. #4 – I have a Walther CCP but want to buy the new M2 version. I’m running a Streamlight TLR-3 light on current CCP. If I buy the new CCP M2 and mount the TLR-3 to it, am I going to have to go buy a new holster for it? (1) If the holster you have now for your original CCP is built to accept the CCP with the TLR-3 mounted to it, then you WILL NOT have to go buy a new holster as the new CCP M2 is the same size as the original CCP and your existing holster should fit the M2 with the TLR-3 mounted just fine. (2) However, if your current holster for your original CCP is not built to accept the CCP with the TLR-3 mounted, then you will in fact need to go buy a new holster to fit the CCP M2 with the TLR-3 mounted. Assuming you might be in the market for one of those, any gun holster models listed below is available in a version to fit the new Walther CCP M2 with a Streamlight TLR-3 mounted. #5 – My wife loves her CCP but I’m really thinking about getting her the new CCP M2 model. I want to get her a holster, but she really wants something with retention on it. Do you carry anything that will work? First, it’s important to be clear on what you mean by “retention” as that can have a few different meanings. Most all leather holsters that we carry that are not equipped with a retention strap use friction as a means of retention. This means that the tightness of the holster and the friction created when the pistol is inserted offers some degree of retention. Now if that amount of retention is not enough for your needs or wants, then you would move to the next level of retention in a leather holster, which would be a model made with a retention strap (also called a thumb break). To answer your question, most any holster listed below is available as a Walther CCP M2 holster, and an optional thumb break can be added to the holster. #6 - I'm trying to find a holster for my original Walther CCP (not the M2 version). Do you carry any holsters to fit it? Holster models listed below are available as a Walther CCP M2 holster option.